In April 2015, Nepal experienced the worst earthquake in the country for 80 years, killing over 8000 people and destroying more than half a million homes. Troubled by bureaucratic turmoil and border blockades with neighbouring India, rebuilding efforts in Nepal have been stunted, leaving many in temporary accommodation and makeshift shelters. In the centre of Kathmandu, a large Internally Displaced People camp is fully occupied. 12 months after the earthquake, many people from surrounding districts such as Sindhupalchowk and Dhading are still living in tents in the camp, equipped only with very basic facilities. Despite the lack of reconstruction, brick factories in the Kathmandu valley are working overtime, engulfing the plateau in smog. Children, migrant workers, and desperate locals all work making the bricks, on a low wage, for long hours, and in extremely dusty conditions. General view of the Internally Displaced Person (IDP) camp in Chuchepati, Kathmandu City, Nepal on 27 March 2016. The camp houses people in temporary accomodation due to the April 2015 earthquake. A young boy prays during assembly at the Tri Ratna Cooperative School, also known as Bungamati School in Bungamati District, Kathmandu, Nepal on 15 March 2016. The school and surrounding village were devastated in the April 2015 earthquake. Children play cricket in the Internally Displaced Person (IDP) camp in Chuchepati, Kathmandu City, Nepal on 27 March 2016. The camp houses people in temporary accomodation due to the April 2015 earthquake. A man pauses whilst rebuilding his sister's house, which was destroyed by the April 2015 Earthquake. The Chuchepati Camp Temporary School in the Internally Displaced Person (IDP) camp in Chuchepati, Kathmandu City, Nepal on 27 March 2016. The camp houses people in temporary accomodation due to the April 2015 earthquake. 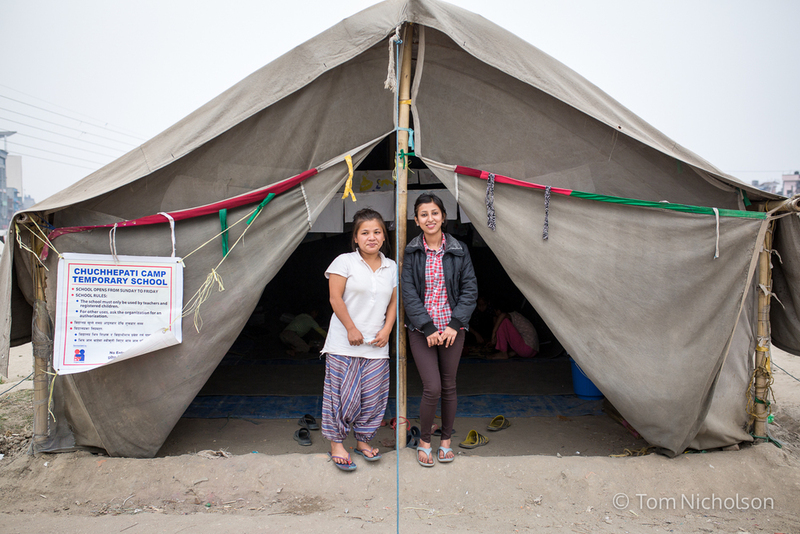 School teachers Binita Rai (left) and Bidhya Khatri at their school called The Chuchepati Camp Temporary School, located in the Internally Displaced Person (IDP) camp in Chuchepati, Kathmandu City, Nepal on 27 March 2016. The camp houses people in temporary accomodation due to the April 2015 earthquake. Children play during spare time in The Chuchepati Camp Temporary School, located in the Internally Displaced Person (IDP) camp in Chuchepati, Kathmandu City, Nepal on 27 March 2016. The camp houses people in temporary accomodation due to the April 2015 earthquake. Children study in temporary classrooms at the Tri Ratna Cooperative School, also known as Bungamati School, in Bungamati District, Kathmandu, Nepal on 17 March 2016. Their previous classrooms were destroyed by the April 2015 earthquake. Brickworks factory at Bungamati, Kathmandu, Nepal on 15 March 2016. Around 400 labourers, including children, work in very dusty and hot conditions. Susmita (15) in the Internally Displaced Person (IDP) camp in Chuchepati, Kathmandu City, Nepal on 16 March 2016. Susmita is blind due to meningitis, diagnosed in 2012, (when she was 11). She lives in the tent with her grandmother, mother, father, and five younger siblings. 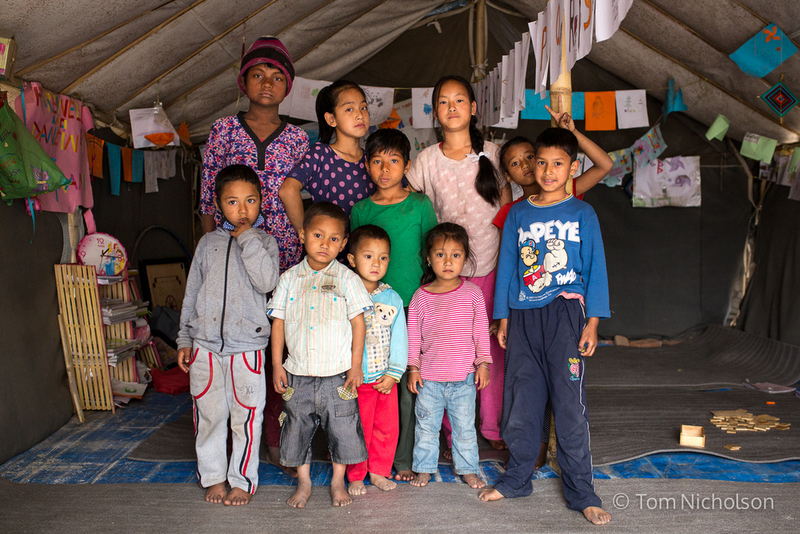 They moved to the camp on 12 May 2015 following the April 2015 earthquake.